I never thought it would work. I thought more ingredients would make a chocolate brownie more, well, chocolaty, moist, scrumptious. But wait! A brownie with no flour? No butter? No oil? No added sugar and one secret ingredient? How does that even work? Well, I found out pretty quickly it works out all too well. These brownies are so delicious I have to steal a line from Food Network’s newest star, Kentuckian Jason Smith. “Lord Honey, (these brownies are) so delicious yo tongue will slap yo brains out.” Yep, that pretty much describes it! I came across this recipe quite a while ago, and besides having no flour, butter, oil or added sugar, it was egg free. 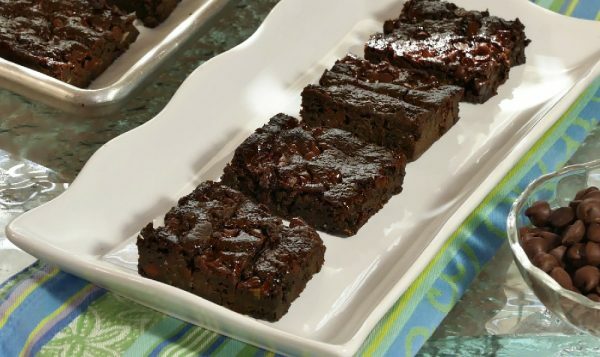 The secret ingredient was grated zucchini, which you will never taste in the baked brownie. I made it several times and it just sort of fell apart on me. (These brownies are very, very moist!) Still, it was so tasty that I refused to give up. I didn’t want to add the flour back in as a binder, so I decided to start with an egg. Perfection! That did it! One large egg was just the thing to hold it all together–the most chocolaty, dense and delicious brownie ever! When I tell you to eat your veggies, this is how to do it! Preheat the oven to 350 degrees. Grease the bottom and sides of an 8 x 8 pan or line with parchment paper. (I used glass baking dish so I can see if the brownies are getting to dark or burning.) With a grater or in a mini food prep, grate the zucchini fine. In a bowl, mix together zucchini, egg almond butter, honey, maple syrup and vanilla until well combined. Combine cocoa powder, baking powder, baking soda and salt. Add to wet ingredients and mix to combine well. Place chopped chocolate bar in a microwave-safe bowl. Heat at 30 second intervals until melted. Let cool for a few minutes, and then mix into the brownie mixture. Fold in the mini chocolate chips. Pour the batter into the prepared baking pan. Sprinkle 1/4 cup chocolate chips over top. Bake for about 35-40 minutes or until toothpick comes up clean. Remove from oven and about 10 minutes later, cover with plastic wrap or aluminum foil while they are still warm. Allow them to cool completely at room temperature. Place in refrigerator for 2-3 hours to harden. These brownies are very soft, dense and moist!